Tumbling off the flanks of the magnificent 3717 meter Volcan Lanin are the headwaters of Pucon’s Trancura River. While lower sections of the river close to Pucon see hundred’s of daily visitors from the numerous rafting companies, the upper reaches of the river are rarely explored. 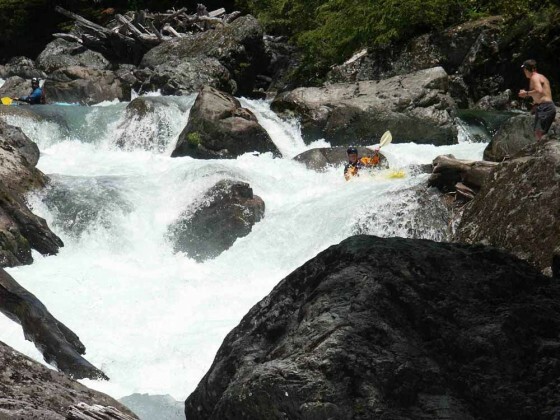 At a distance of only 67 KM from Pucon is the put-in for one of Chile’s premier creek runs. This section of river has been dubbed the Puesco section and should be on every class 5 kayakers “TO DO LIST”. The crystal clear water and extreme gradient make for an unforgettable day run. To reach the river take the international road from Pucon to Argentina heading towards Paso Tromen or Mahuil Malal. From Pucon to Curarrehue (turn of for Maichin) it is 42 KM of paved road. From here to Put-in at Puente Puesco it is another 25 KM on what is now gravel road but soon to be paved. Before crossing Puente Puesco there is a turn off to the right. Head back this dirt track 100 meters, park and put-in on the calm waters of the Rio Puesco. Do not block this road as it is used by local residents. At the put-in The Rio Puesco is very small but within approximately 500 meters the Rio Momolluco enters from the right and more than doubles the flow. From this point down the river (now actually the Trancura) gets very steep with countless ledge and boulder drops. About 1 KM down the river one will encounter a particularly burly drop called Tres Troncos which was aptly named for the 3 logs which are commonly pinned into the right channel of the drop. Depending on logs every drop on the river is run-able but everything can also be portaged. 3 KM into the run you will pass under a wooden bridge then a café on river left. The road is nearby and this is a possible takeout. One can continue another 4 KM downstream with lots more challenging whitewater that has less gradient than the upper 3 KM. Once you reach some braided gravel bars it is time to get out and hike back to the road. From the river it is hard to know where to get out but from the road a good marker is blue church on river left approximately 7 KM below put-in.